The Severn Way is 210 miles in length, tracing the river Severn from its beginning in the slopes of Plynlimon to its end in Bristol City centre. The route travels through the beautiful and scenic Severn Valley, taking in glorious countryside and towns and cities such as Welshpool, Shrewsbury, Worcester and Gloucester. 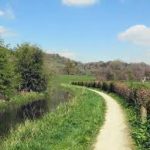 The trail follows the river where possible but also makes use of nearby paths such as parts of the towpath along the Montgomery Canal from Newtown to just beyond Welshpool. Welshpool Tourist Information Centre stocks a useful guide book to the walk as well as souvenirs to purchase as mementoes.